At the recent budget workshop, Chief Hooper cited a 17% increase in violent crime, much of it downtown. I am requesting more context and specific details on how the figure was calculated. If available, I would like to request the documents or data that were used in this calculation. Specifically, I am interested which timeframes were used in that comparison, which categories of crime are referenced as "violent," and whether that increase is a department-wide figure, or limited to specific areas. If APD can also provide the raw numbers used to generate this statistic, that would be a great help. Good morning! Below please find a response to the inquiry. The Asheville Police Department is required to submit a monthly report of Part 1 crime statistics to the State Bureau of Investigation (SBI). Each time we submit this report, we also include minor corrections to the prior months’ data. The SBI incorporates these corrections into their final crime statistics, which are typically released to the public each Fall. The 17% increase that Chief Hooper referenced utilized raw crime numbers, prior to being finalized. 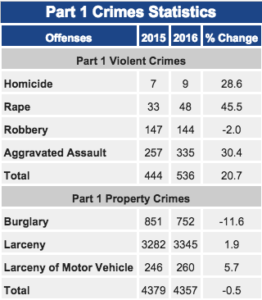 The chart below depicts these final numbers and shows a 20.7% increase in violent crime from calendar year 2015 to 2016 in the City of Asheville. We have all of your requests sent Wednesday and are working on them. Thank you for your help with this request. We hope you have a great day! “At the recent budget workshop, Chief Hooper cited a 17% increase in violent crime, much of it downtown. I am requesting more context and specific details on how the figure was calculated. If available, I would like to request the documents or data that were used in this calculation. Specifically, I am interested which timeframes were used in that comparison, which categories of crime are referenced as “violent,” and whether that increase is a department-wide figure, or limited to specific areas.